Taxes can take a chunk out of your finances and make it hard to keep growing your account. Take a look at my 2017 taxes and see how I started saving money a year in advance. Taxes are one of the reasons I started The Biglaw Investor. I have no problem paying them, I just didn’t realize how big of an impact they’d have on building wealth when I was back in law school. For many years now I’ve done my own tax preparation. I’m sure this saves a little money but I mostly do it to learn the tax code. Ever since I started working in Biglaw my knowledge of the tax code has skyrocketed and continues to grow. I learn something new each year. Yet, I still consider myself an amateur. Tax knowledge is the area where I’d like to improve the most and I think doing a post like this year each year will help. Despite my amateur tax status, the biggest lesson I’ve learned is that the big boost to savings money on taxes comes in tax planning for the next year. If you’re trying to save money when you’re filing your taxes, you’re probably too late. So, without further ado, here’s how I did this year on my taxes and what I’m planning on doing for the coming year. What Did I Pay In Taxes? Living in a high cost-of-living city means I’m subject to substantial taxes at all angles. This means it takes a little extra work to figure out my effective tax rates each year. I don’t just want to trust the number from Turbotax. To figure out my effective tax rate, I use my gross income as the denominator (i.e. line 22, plus 401(k) contributions, plus all of the exempt wages and section 125 wages). Those additional exempt wages are things like healthcare insurance premiums, HSA contributions and qualified transportation expenses that come out of your income and are not reported on Box 1 of your W-2. My W-2 statement has a handy box at the end detailing my “gross wages”. See if yours does too. The numerator is simply the amount of taxes I paid. (1) My doctor friends taking advantage of geographic arbitrage by earning high salaries in low cost-of-living places are making out like bandits. It’s not cheap to live in NYC and I paid 9.25% of my gross income to New York State and City as a privilege. Shout out to my Texas Biglaw lawyers earning the same salary but paying zero in state and city income taxes. That’s a significant amount of extra cash you’re keeping. (2) The percentage paid to the federal government seems lower than you’d expect if you just looked at the tax brackets. Yet, I’m still paying a higher federal rate than I would like to be. I need to keep making decisions that open up more and more tax-advantaged accounts so that I can shelter more income in the future. (3) The overall effective rate at 36.00% is still pretty high. It’s a privilege to live in the United States, so I don’t mind paying it, but I’m still happy to modify my behavior as it suits the government so that I can effectively pay less taxes. That’s the point of paying attention to your taxes each year and making additional tweaks as time goes on (ironically, I’m paying about the same percentage of my income in taxes today as I did when I was a first-year associate, so that’s a pretty good win in my book). (4) The Obamacare additional Medicare tax is pretty small. (5) Total taxes paid were nearly 4 times my entire salary at my first full-time job. Tax software is a great way to figure out your marginal tax rate each year. You can just add $1000 to your earned income and then see how much additional federal and state taxes you have to pay. For me, my federal tax + payroll goes up by $350 and my state and city taxes go up by $106 for a total additional tax due of $456. Therefore, my marginal rate is 45.6%. That means each additional dollar earned will see 46 cents paid in taxes. The flip side is also true – each dollar saved in a pre-tax retirement account will reduce my tax bill by the same amount. People want to know what they can do to reduce taxes and drive down their effective tax rate. I’m all about figuring that out too. One thing to keep in mind is that my actual effective tax rate is even lower than the number above because a lot of income is now being generated in retirement accounts. The interest, dividends and capital gains in those accounts do not show up as income on my tax return and I plan on keeping it that way. So, what can you do to lower your taxes? Retirement accounts take a little bit of effort to set up. But once you start building up cash in tax-advantaged space, it becomes obvious pretty quickly that they are good for your finances. Generally, I’m always looking for more tax-advantaged space and making decisions that lead to more retirement accounts being available to me. It first started with the 401(k) followed quickly by the Backdoor Roth IRA. Once I switched to a firm that offered a High-Deductible Health Plan, the Health Savings Account became the next retirement account available to me. There are more accounts on the horizon. If you also want to pay less taxes, you should figure out a way to avoid paying taxes on $21,350 of your income. While I will eventually have to pay taxes on the amount in the retirement accounts, I am very confident that I’ll be able to access it at an effective rate that is significantly lower than my current 45.6% marginal tax rate. Saving taxes at 45.6% and then paying them later at something like 20% is a winning proposition every time. Nobody likes losing money, but when you do the government and taxpayers are willing to share in your loss. Thanks to a few times where I swung for the fences early in my career, I have carry-forward capital losses that I can apply against my current income. I also have taken advantage of tax-loss harvesting to generate additional paper losses. This allowed me to deduct $3,000 against my income this year and I have capital losses that will carry forward for the next few years. My W-2 has a handy table on the last page that shows me my “gross wages” which includes not only the compensation reported on Box 1 of my W-2 but things like HSA contributions, health insurance premiums and qualified transportation expenses (i.e. monthly commuter card). Excluding 401(k) and HSA contributions, I was able to shelter another 1.4% of my income through participation in the various benefits offered by my firm. That may not seem like much but it resulted in over $1,000 added to my bottom line. While charitable giving was lower this year than I would have liked, if you’re itemizing your deduction (most of you in Biglaw), don’t forget that all of your charitable contributions are tax free. Most people remember this for things like $50 and $100 checks you write to support a favorite cause, but did you also remember that all of your donations to the Salvation Army are also deductible? If you live in a big city like us, I bet you’re always putting together a bag or two for donations. I lay everything out before I donate it and take a picture which is then saved in my taxes folder for the current year. You could also use ItsDeductible.com in connection with Turbotax to keep track throughout the year. Part of doing my taxes each year is learning what didn’t help, even if it seemed like a good decision at the time. Here’s what didn’t help lower my tax bill. Typically, you can add your state and city tax payments to Schedule A as part of your itemized deductions. This is helpful since it prevents you from paying federal taxes on the money that you pay to state and city governments. So, one would think that living in a high state and city location has at least some benefits. Of course, you’d be wrong to make that assumption, since the Alternative Minimum Tax effectively eliminates a taxpayer’s ability to claim state and local tax deductions. In order to see if you’re subject to AMT, you run your taxes through two parallel tax systems (ordinary taxes and AMT). You pay the higher of the two taxes. I continue to be subject to AMT, which means that my high state and local taxes are worthless when it comes to catching a tax break (although they do help me cross the threshold for itemizing deductions, therefore making other Schedule A deductions more valuable than they would be if I were taking the standard deduction). It seems like a great thing when your taxable investment account is spitting off capital gains and dividends. You’ve invested in many companies. Those companies are doing well, making money, and they’re sharing part of that profit with you, the owner. The problem is that you really don’t need this income during the accumulation phase of your life when you’re in the highest bracket you’ll ever be in. But you don’t really get a choice in the matter as the dividends keep coming and you’re forced to pay taxes on the income. Sold off shares in British Petroleum. I haven’t been immune from trying to pick stock winners and have been slowly unwinding my positions (this was the last individual stock I owned). BP paid pretty handsome dividends to me year after year, including $1,200 worth in 2016. While I was happy to receive the income each year, I’ve known for awhile now that earning $1,200 in dividends and then paying 15% capital gains on the dividends wasn’t the best deal. Instead, I’d rather lock that money up in an index fund that mostly grows through capital appreciation. With capital appreciation, I get to decide when to sell the shares and therefore when to trigger the taxes (if you’re interested in more about this, see the book review of The Overtaxed Investor). At my income level, your deductions start to phase out thanks to Donald Pease and the phase out. This is really just an extra 3% tax on high-earners and there’s nothing I can do to avoid it. The AMT is a similar problem that continues to keep me within its grip. This year the AMT amounted to 8.7% of my total Federal income tax. There’s not much you can do about AMT besides increasing your income so that eventually you accelerate out of it. If you completed a Backdoor Roth IRA this year, here’s my annual reminder to make sure the tax software correctly filled out Form 8606. 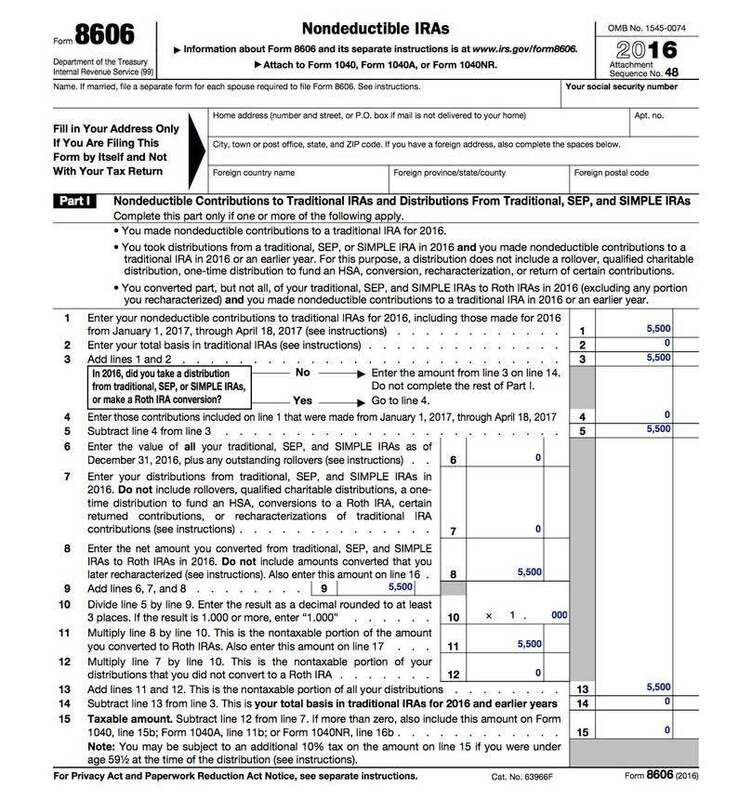 Form 8606 shows your Backdoor Roth IRA contribution and you want to make sure Line 15 (Taxable amount) shows $0. You can save a lot of money on taxes if you’re able to shelter $68,400 from income taxes. I’m always looking for more ways to stuff money into tax-advantaged accounts and only expect this number to grow each year. Having eliminated all my individual stock holdings, I’m now on a path to generate significantly less dividends and capital gains next year. While those seemed nice on paper, I have no need for he income right now and am happy to exchange them for capital appreciation. Overall, I’m pleased with the progress I’ve made over the last 5 years in keeping my tax bill as low as possible. I look forward to continuing the challenge next year! What do you think? What was your effective tax rate this year? What are you doing to lower it? Comment below! This is a terrific peek behind the hood and a good exercise for anyone to do. I may do something similar myself once I finalize my taxes. I don’t think a lot of us actually do the math to see what our effective tax rates are. It takes a lot of time to pull together the numbers. I can see why people don’t do it, but I found it very helpful, particularly because I think it’ll result in less taxes next year and the year after, etc. I respect your privacy, but would you be willing to share a range of your actual income? it will shed more light on the post. I’m not going to post specifics, but it shouldn’t be too hard to figure out. I’m a senior associate in Biglaw, so you either know the salary structure or can figure it out via Google. I posted how much I made from the blog in the below post (but in actuality, the number below is just the revenue and I lost money blogging last year). I’m a big fan of doing my own taxes also. I hired it out when I bought some rental properties, but I had to gather all the info anyway so I returned to doing it myself. The easy part is plugging in all the numbers, especially with the software today. Also, with tax planning for retirment, it’s a huge advantage to know what type of income is taxed and by how much. The knowledge gained by doing our own taxes is huge. Have you tried to find any CPA’s that go the extra step and help with tax planning? It’s been incredibly difficult for me to find anyone that does any more than file the forms. 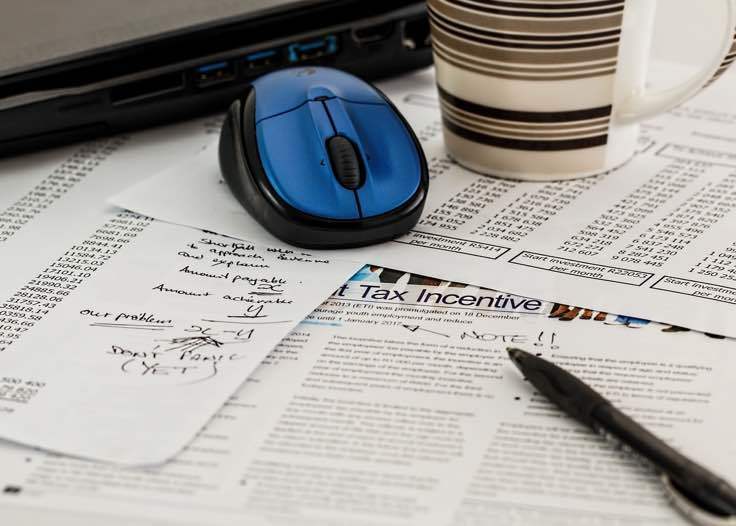 I haven’t tried to find any CPAs that help with tax planning but my general understanding is that most CPAs are too busy crunching the numbers and getting the tax returns prepared to help much in terms of planning. I’m sure the better ones set up meetings with you during the year but that may be more in the realm of a fee-only financial advisor. Let me know if you find anyone good to work with! Our effective tax rate is closer to 17%, but we’re fortunate to live in a state where tax rates aren’t nearly as high. We were able to take advantage of some suspended passive losses this year, which helped keep that rate low. We are using many of the same strategies to keep our taxes low-shelter income in retirement, IRA and HSA accounts, and invest in index funds with low turnover, and contribute a significant amount to charity. (Side note: after getting married you will be able to contribute more to your HSA). I’m interested to see what will occur in the tax law in the future under the new administration. It’s certainly time to get rid of the AMT, but I’m not fond of the other proposed measures so far. If I can convince my future wife to drop the better healthcare coverage for an HDHP, then yes we will max out that HSA for sure! I’m also interested to see what (if any) changes get made to the tax code. Nice work on a 17% effective tax rate! Great article. My effective tax rate was 26% for 2006. My work allows me to defer income via NQDC account, so I leverage that to minimize my taxes. I wish taxes were simpler! All that deferred compensation is good stuff! I wish taxes were simpler too, mainly just so that it took less time and energy to plan. 30% to 35% despite geographic arbitrage, which doesn’t always equate to tax aribitrage. I make an above average salary in a below average cost of living area, but pay a marginal state income tax of 9.85%. One state over, there’s no state income tax. Crazy how that is. I just want to say thank you for paying “your fair share.” Been doing it for years. That reminds me of an old Atlantic article I read that laid out how much money the various states receive in return for each $1 of federal funds they send out. It’s probably an imperfect metric, but some taxpayers in certain states pay more than their “fair share”. So, I think we should be thanking each other for paying “more than” our fair share but I’m okay with it because at the end of the day we’re all Americans. The AMT is just an alternate way to calculate your income taxes. At a certain income level (will be different for each person) your deductions and exemptions are phased out to the point where you’re paying the same or more under the regular tax system as you would under AMT. At that point you leave AMT’s grasp since the system always defaults to the higher of the two calculations. You’re not really better off by accelerating out of AMT except that you don’t have to worry about AMT calculations. I’ll be one of the few couples that actually benefits from getting married. Looking forward to paying less taxes next year! Now that I finished my taxes, I want to calculate our total effective tax rate. Need to do some W-2 digging. Once you’ve figured it out, let us know!